ND, Englevale: Larson Grain Co. The Andersons install a CompuWeigh 60,000 bph bulk weigh scale at their new facility in Humboldt, TN. IL, Chestnut: Farmers Grain Co.
Are you earning $30,000 Bonus? At the groundbreaking for the facility, AGP CEO Marty Reagan shared his vision of "a steady flow of rail cars transporting agricultural products from the Midwest to the West Coast for connection with world markets." Commodity Resource Corp.â€™s unique approach to the feed and fertilizer businesses at its new Caledonia, NY facility requires an equally unique approach to plant automation. New bulk weigh scale loadout tower at Floyd Valley Grain LLC in Hinton, IA, houses a 60,000-bph CompuWeigh bulk weigh loadout scale. Kokomo Grain Inc. in 2002 added 1.1 million bushels of storage space at its Amboy, IN rail loading terminal, in order to accommodate ever-larger harvests without having to pile grain on the ground (covered in the March/April 2003 issue of Grain Journal). 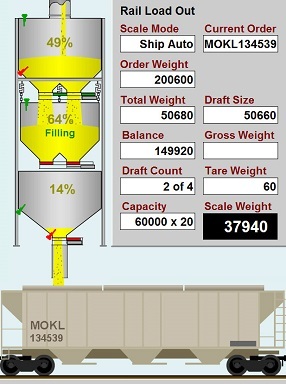 "CompuWeigh's controller and Process Hopper Scales have been valuable tools in automating our production process and capturing the data we need to be more efficient"
Two global leaders in the production of plastic products wished to increase the efficiency and safety of their operations in the plastic â€œregrindâ€ area, and to increase the amount and timeliness of information available to them on the overall process yield. The centerpiece of the upgrade was a new 60,000-bph bulk weigh loadout scale manufactured by CompuWeigh Corp.